Modeled Writing "The Write Aloud"
Oct. 2, 2018, 11:18 a.m. Writing is an abstract macro-process that must be taught explicitly, followed by guided and independent practice. Writers need to learn to make a series of decisions using their schema and executive skills for planning, organizing, avoiding distraction, and staying focused on the message. Becoming a proficient writer takes years and needs to begin early in life. What are some ways we can teach students to become successful writers? We should plan to spend about 30% of our instructional time writing for and writing with our students. In order for students to become proficient writers, they will need to write a lot and receive feedback that moves them forward. Focus on the content of the writing first and then on the conventions. You can have a piece of writing that follows all the convention rules, but says nothing. This isn't the goal. Ideas come first, then conventions. One of the most powerful instructional strategies for teaching writing is modeled writing! It is also known as "Writing Aloud". This is the "I do, we do" part of the gradual release of responsibility. Just like read alouds that provide a model of what proficient reading looks and sounds like, write alouds help the novice writer see and hear what good writers think as they plan, organize, draft, revise, edit, and publish a piece of writing. 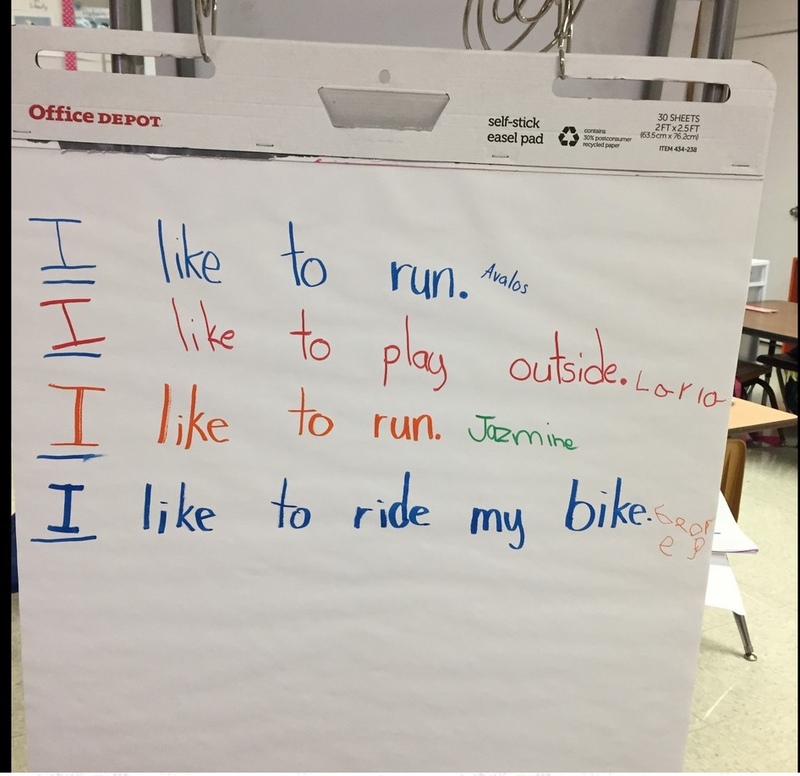 The teacher then writes "I like" and has a student say what they like followed by the students initials to show ownership of the sentence. The teacher then continues the list for other students. Students can then practice reading the sentences with a pointer. Below is a picture of Ms. Avalos' kindergarten class who just completed a predictable chart. Ms. Avalos turned her predictable chart into a shared writing activity. Teachers can model writing short pieces within specific genres for students. Children need a demonstration of the thinking that happens before you even pick up a pen. Start by brainstorming a simple list or outline before you begin. Be sure to explain the importance of the planning phase. The most important strategy for the write aloud is modeling your thinking as you write. We cannot expect students to have the thinking process if they have never seen them in action. Model for students what your brain is saying as you write. This is also a great time to model your revision skills like rereading and substituting words or phrases to better convey your intended meaning. For more information on best writing practices, join us for a virtual training all about giving kids opportunities to write, Kids Need Opportunities to Write! But, How? on October 13th, 2018! Kelly Harmon & Associates began in 2001 with a mission of instructional coaching and providing rich literacy resources for educators and parents. Our work incorporates research-based best practices for teaching and learning.